We are experts in garage door openers of all types and service them excellently. The modern garage door openers do a lot more than automating the opening and closing of the door. These devices shut down if there is something wrong with any of the components of the system to prevent further damage. They have safety sensors and a reversal mechanism for protecting people and properties from serious accidents. The rolling code technology changes the code automatically after each use of the door to provide high security. If you cannot get one or more of these benefits because of opener issues, we will come and deal with them quickly. Our garage door opener repair service is all-encompassing. We fix devices of all types, ages, models and brands. 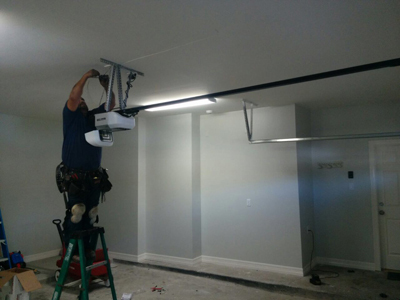 If the new LiftMaster unit, which you got just a few months ago, stopped working all of a sudden or there is a serious issue with the chain drive of the Craftsman operator that you have been using for years, we will come and provide complete resolution to the problem. Our technicians have superb technical skills in addition to extensive expertise. One of the main reasons why households and businesses choose us, at Garage Door Repair Saratoga Springs, is the speed which we work with. If you need immediate assistance, you can use our emergency service. One of our mobile crews will be with you in minutes and deal with the problem right there and then. We fix openers of all types and brands without any kind of delay because we have the best spare parts at hand. If you have a Marantec unit with broken gear or a Chamberlain device with smashed safety sensor, we will provide the required repair straight away. We do a lot more than providing garage door repairs. We provide complete opener replacement which is fast and dependable. Our service covers every step of the project. We will do everything from providing assistance with the selection of the new device to programming its remote and testing the safety sensors. We can help you enjoy perfect peace and quiet with a new belt drive unit. You can have the latest Genie opener with screw drive design and advanced Intellicode technology. Our range of professional services includes opener maintenance as well. We will take perfect care of the device you have and the entire door system to give you safe and effective operation at all times. Fill out the contact form on our website to make an enquiry.